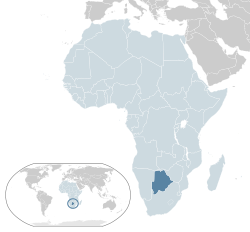 Botswana (officially called the Republic of Botswana) is a country in southern Africa. The capital of Botswana is Gaborone. The countries that border Botswana are Zimbabwe, South Africa, and Namibia. It is also possible to travel from Botswana directly into Zambia by crossing the Zambezi River by ferry. Botswana is landlocked. All of Botswana's trade must be brought in over land, or by airplane. The two most important geographical features in Botswana are the Okavango Delta and the Kalahari Desert. People from Botswana are called Batswana. The population of Botswana is about 1.8 million. This is only 2.7 persons per km², a small number for a country of this size. This is because most of the country is desert and very dry. Botswana has two official languages. One is English. The other is a local language called Setswana (also called Tswana). Botswana is a democracy. The people vote for their political leaders. Those leaders vote for the president. In 2008 Ian Khama became the current president of Botswana. President Khama won elections in 2009 and 2014. The economy of Botswana has been growing very fast since it became an independent country in 1966. The people of Botswana have had the world's fastest growth in standard of living since that time. Botswana's economy comes mostly from mining. This includes diamonds, metals (including copper) and minerals (including salt). Botswana is the highest producer of diamonds by value in the world. In 1999, Botswana produced over 30 million carats (6,000 kg) of diamonds from the three Debswana mines. That is about 25% of worldwide production. Tourism is also important to the country. Many people come to Botswana each year to see its wildlife. The currency of Botswana is called the pula (which means rain). It is made up of 100 thebe (which means shield). In 2017, one US dollar is about 10.32 Pulas. ↑ "Office of the President (OP)". Government of Botswana. Retrieved 30 October 2016. ↑ Central Intelligence Agency (2009). "Botswana". The World Factbook. Retrieved 3 February 2010. ↑ 3.0 3.1 3.2 3.3 "Botswana". International Monetary Fund. Retrieved 2011-04-21. ↑ "Botswana diamonds". Know Botswana.com. Retrieved December 24, 2014. ↑ "XE: Convert USD/BWP. United States Dollar to Botswana Pula". www.xe.com. Retrieved 2017-05-17. This page was last changed on 20 July 2018, at 21:18.